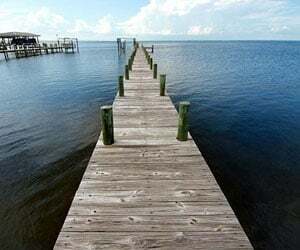 Point Washington, on the north side of Highway 98, extends across the shore of the Choctawhatchee Bay from Highway 331 to Peach Creek. Just ~17 miles east of Destin and west of Panama City Beach, Point Washington provides a quiet, natural setting for families and adventurist within easy commuting distance to popular shops and restaurants. Point Washington is a bayou community with beautiful water views, oak trees shrouded with Spanish moss and a variety of historic sites. 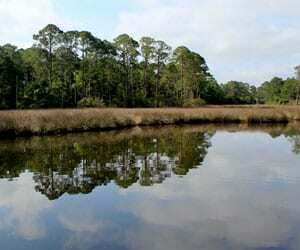 A main feature of Historic Point Washington is Eden Gardens State Park. The park centers on the beautifully renovated, two-story Wesley house with elegant white columns and wrap-around porch. Named after a wealthy Florida timber family, the park is part of the family’s estate. The park also features many gardens and bay views. Point Washington State Forest is 15,000 acres and features over 10 miles of trails to challenge bicyclists, hikers and nature lovers. The forest covers a large portion of South Walton and contains sand hills, basin swamps, wet flatwoods, wet prairie and cypress swamps. Daughettes Subdivision has a natural mix of magnolias, oaks and palms that give an “Old Florida” feel. Many homes in this subdivision have bay or canal access. The Woods is a bay front community embracing the “Old Florida” feel with mature oaks and magnolias on large residential lots. 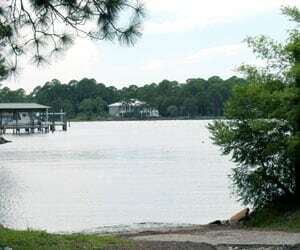 A community waterfront park provides a wonderful place for family fun and relaxation on Choctawhatchee Bay. Audubon Point is tucked between two natural conservation areas off County Road 395 North in Point Washington. Just steps away from Eden Gardens State Park and Bay Elementary, this community offers quiet seclusion while being close to many South Walton attractions like Seaside, WaterColor and Grayton Beach State Park. Audubon Point homes have tin roofs, traditional exteriors, floor plans ranging from 2,034 square feet to 3,124 square feet and 3 to 4 bedrooms and 2.5 bathrooms. This low-density 19 lot community features new home construction from the popular builder D.R. Horton. Affordable new homes close to Eden Gardens State Park and the Choctawhatchee Bay provide easy coastal living at a fraction of 30A costs. These brick homes feature 3-4 bedrooms, 2-3.5 bathrooms and 2-car garages. Peach Creek is a new construction community located on Peach Creek that connects to Choctawhatchee Bay. All construction is almost complete for these all brick, 3-4 bedroom, 2-3.5 bathroom affordable homes. The community features low HOA fees and close proximity to Pier Park in Panama City Beach. A main feature of Historic Point Washington, Eden Gardens State Park centers on the beautifully renovated, two-story Wesley house with elegant white columns and wrap-around porch. Named after a wealthy Florida timber family, the park is part of the family’s estate. The park also features many gardens and bay views.